• fresh low-carb veggies to serve with the dip such as celery, red pepper strips, sugar snap peas, cauliflower, broccoli, jicama, etc. 1. Let shrimp thaw overnight in refrigerator, then drain well. 2. Use food processor to blend together the cream cheese, sour cream, lemon juice, celery salt and dried dill weed. Remove from food processor and put into mixing bowl. 3. Stir in chopped green onion and chopped bell pepper, then gently fold in shrimp. 4. Chill dip for at least an hour before serving for best flavor. 5. Serve with celery, red pepper strips, sugar snap peas, cauliflower, broccoli, jicama, or other on-plan veggie dippers of your choice. Spray a large baking dish or rimmed baking sheet with cooking spray. In a medium bowl, stir together the melted butter, lemon juice, lemon zest, garlic and dill. Rinse flounder fillets and pat dry. Place in baking dish and season with desired amount of salt and pepper. Evenly drizzle butter mixture over flounder fillets. Top with lemon slices, if desired. Bake for 10-11 minutes, then broil on high for 3-4 minutes. Fish is cooked when it flakes easily with a fork. Place trimmed asparagus onto a parchment paper-lined large sheet pan. Brush with olive oil and sprinkle with salt and pepper. Distribute half the amount of minced garlic on top of the asparagus and then sprinkle ½ Tablespoon of thyme leaves as well as about 3-4 Tablespoons of the cheese on them. Bake for 8 minutes. Meanwhile, place shrimp on wood skewers, about 5 shrimp on each skewer. Remove pan from the oven and scoot asparagus over to the side(s) to make room for the shrimp skewers. Brush shrimp with olive oil and repeat the same process of sprinkling on the spices and cheese using the remaining amount of ingredients. Bake for 5 minutes or until shrimp turns pink. Squeeze lemon juice on top of the shrimp and asparagus and serve immediately. 2. Wash asparagus, dry in a clean dish towel. Line them up and cut off the tough ends. 3. Make sure cod pieces are very dry. You may have to dry them with a paper towel. Line cod pieces in a line down the center of the baking sheet. 4. Divide them evenly among each side of the pan, spray with your preferred cooking oil and then add seasonings (lemon pepper and garlic salt) to taste. 5. Make sauce by combining all sauce ingredients in a blender or with an immersion blender. 7. Bake for 20-30 minutes until fish is flaky and reaches an internal temperature of 155F. 1. 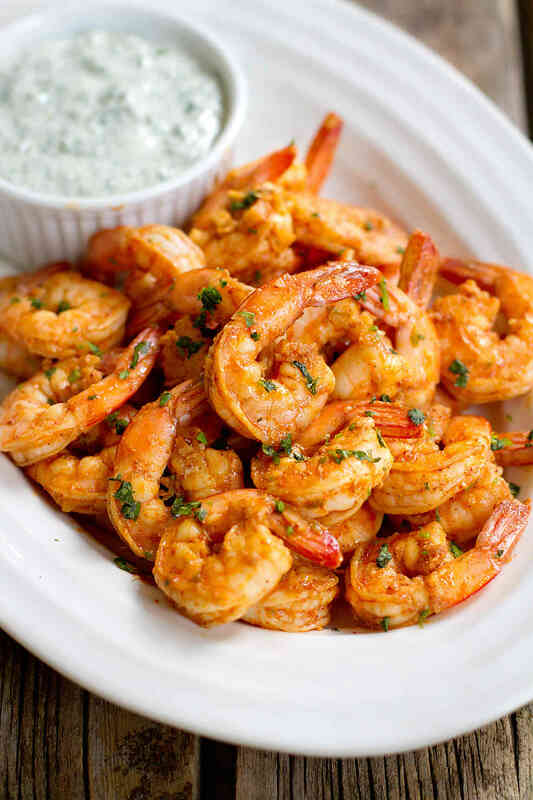 In a large bowl, combine the shrimp, olive oil, garlic, chili powder, lime zest and salt. Toss to combine. Let rest for 15 minutes. 2. Heat a large non-stick skillet over medium-high heat. Add the shrimp mixture and cook until the shrimp are just cooked through, about 1 minute per side. 3. Squeeze the lime juice over the shrimp and stir to coat. 4. Transfer the shrimp to a serving platter. Serve with the yogurt sauce. 1. In a medium bowl, stir together the yogurt, cilantro, milk, lime juice, garlic, honey and salt. Serves 2 with 1 lean, 1.5 green per, .5 condiment per serving. You may add more veggies to make it a full green serving. 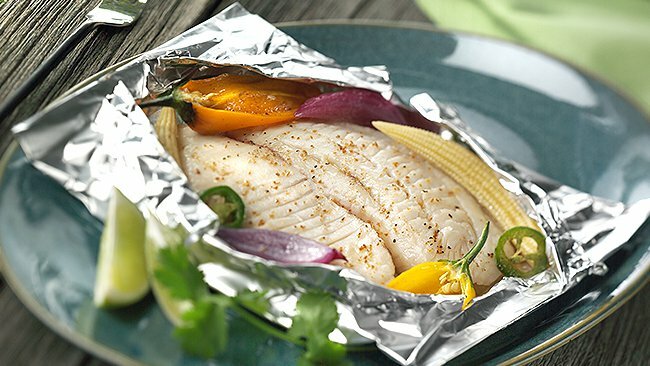 Lay out a foil square for each dinner. Layer the fish, pepper and red onion pieces, a couple cut tomatoes, a squeeze of lime, drizzle with olive oil, season with Seasoning. Fold over the foil and seal it like a pouch.